The AA are asking members of the public to survey motorists at junctions this week reporting driver behaviour – including speeding, seatbelt wearing, mobile phone use, indicator use and defective brake lights. Their survey takes about an hour and must be completed by 9 May 2011. If you think any of these are issues in your neighbourhood then why not choose a suitable junction and get on with it. Last year they got people to do surveys of local conditions for pedestrians (broken kerbs, dog mess, pavement parking etc). 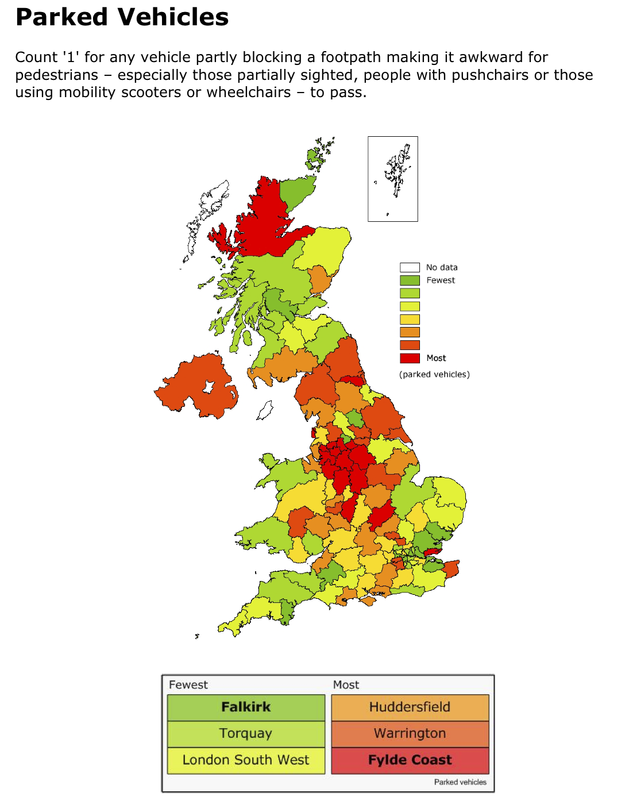 Here is the map they produced highlighting which parts of the country had more and less pavement parking. I notice that my area is ‘not too bad’, if that is the case then I do really pity the red areas! It is great to see the AA, which was set up to warn motorists of police speed traps, doing work like this.